Ten or so years ago there were only two types of fibre, multi-mode or single-mode, and people rarely got them mixed up. 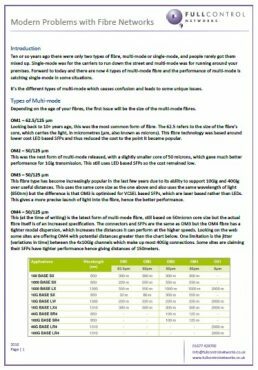 Forward to today and there are now 4 types of multi-mode fibre and the performance of multi-mode is catching single-mode in some situations. The different types and varying colours of fibre causes much confusion and leads to some unique issues. Download this whitepaper, written by one of our engineers, to ensure you are fully aware of the potentials pitfalls of modern fibre networks.